Mitutoyo America Corporation announces the release of MiCAT Planner v1.5 for the company’s coordinate measuring machines. In as little as one click, MiCAT Planner automates the generation of measurement programs based on CAD models containing Geometric Dimensioning and Tolerancing (GD&T) information, as well as your Dimensional Measuring Equipment (DME). When no GD&T information exists, it can easily be added. Multiple Coordinate Systems. MiCAT Planner now supports the import of multiple CAD coordinate systems and the creation of multiple part coordinate systems. These features can be created from the Plan View or the 3D View. Connection Line and Connection. The connection feature support has been expanded to include connection lines and planes. Mid-point, Mid-line and Mid-plane. These constructed features can be set as datums, used in an alignment plan and as referenced features for other constructed features. MCOSMOS Report Template Selection. Report templates for the measurement program can be selected from the GEOPAK installation directory. Angle Between Line and Line. 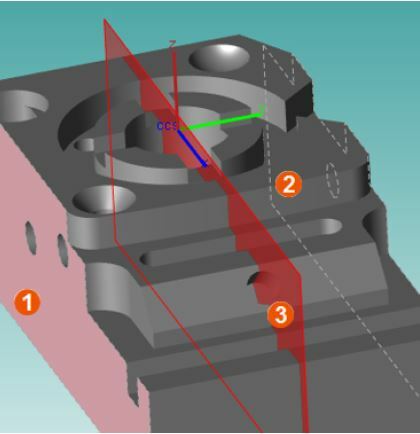 Angle tolerances can be created from non-intersecting combinations of 2D or 3D line and axial features. Features that do not intersect will be created using a projection plane in the current PCS. Concentricity of Point Reducible Features with a Circle Feature Datum. Support for the concentricity tolerance was added for circles, construction circles, and spheres. The tolerance must reference a circle feature datum. For a PDF of the press release, click here. To download the photo, click here. Mitutoyo Corporation is the world's largest provider of measurement and inspection solutions offering the most complete selection of machines, sensors, systems and services with a line encompassing CMM (Coordinate Measuring Machines), vision, form and finish measuring machines, as well as precision tools & instruments, and metrology data management software. Mitutoyo's nationwide network of Metrology Centers and support operations provides application, calibration, service, repair and educational programs to ensure that our 8,500+ metrology products will deliver measurement solutions for our customers throughout their lifetime.